A similar process is happening right now in dozens, if not hundreds of non-profit programs all over the city. Despite their efforts however, drop-out rates and youth violence continue to grow. 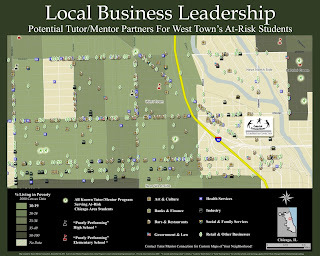 Tutor/Mentor Connection (a related non-profit that specializes in building maps and strategies that facilitate this process of building tutor/mentor “teams”) maintains that more volunteer “coaches” are needed to recruit and train new student and parent “players” in new program “teams” everywhere, to attack these social woes at their core. I will be performing with my band and plugging my maps and efforts from the stage, and I'm excited to announce that the indie hip hop coalition, The Black Temple 21, joined the bill last week, and this week, another former Wildcat football player joined our team. Come see former Northwestern Wildcat quarterback Alexander Webb perform a set of his acoustic blend of classic motown and modern rock at the event. * 21+, Sunday, August 29, 2010; 5pm doors; Show at 6pm. My role with Tutor/Mentor Connection is always exciting - I get to wear many hats and utilize my diverse personal skillset every day: Mapmaker, Public Speaker, Marketing/PR, Web/Tech guy, and graphic designer. I get to meet politicians and business leaders... and I get to work weekly as an educator (I'm an M.Ed. ), with the kids who attend Cabrini Connections Tech Club on nights when their peers might be on the streets. 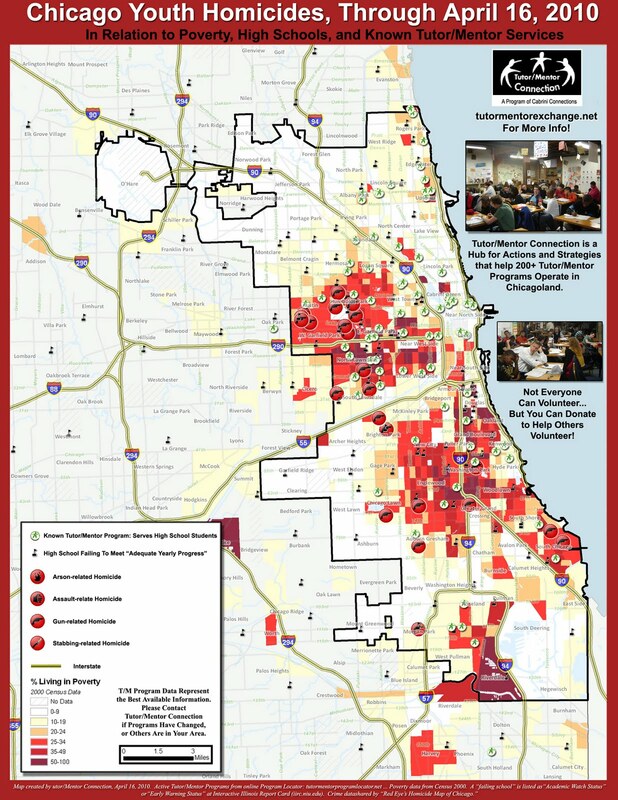 I've shared on this blog how our political and business and other community leaders need to step up to the plate to ensure programs like Tutor/Mentor Connection (T/MC) can continue to serve our students and ultimately you and me. These are programs our leadership often cite as necessary in the fights against crime, escalating taxes, and the drop-out crisis. I make maps to help people like them and people like you visualize the problem, create strategies, and take action. * DONATE to help if you can't make it. WHAT? Tutor/Mentor Jam 2010, a Back To School Benefit for Tutor/Mentor Programs, programs that aid public school students. WHEN? Sunday, August 29, 2010... 5pm = doors & FREE FOOD (cash bar)... Shows starts at 6pm. WHERE? 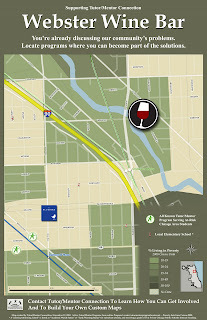 Darkroom, a music venue situated in the heart of Chicago's West Town Neighborhood, just west of Cabrini Green. HOW? PURCHASE TICKETS NOW! $10 Advance July only ($15 in August, $20 door). WHY? 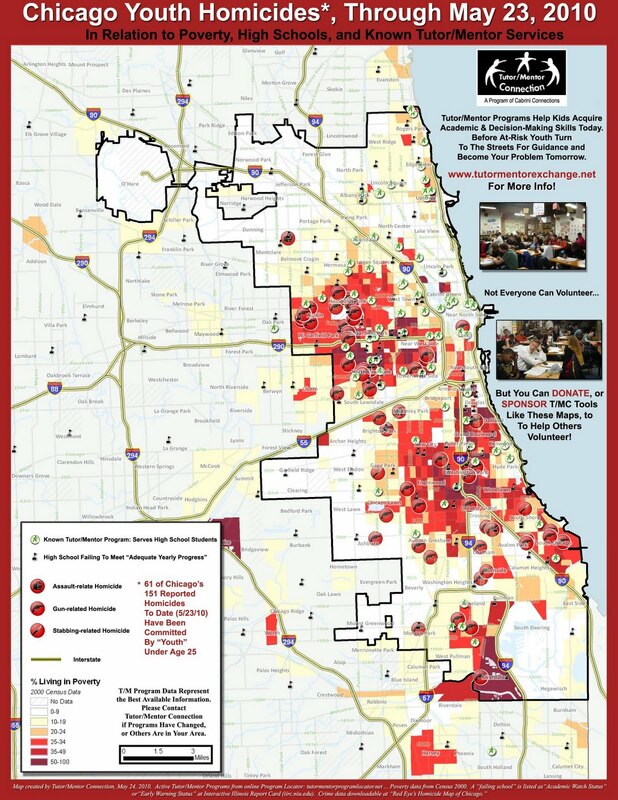 This coming-together of bands, entertainers, and the local business community represents a village, coming together to draw public attention and support toward volunteer-based, non-school tutor/mentor programs in high-poverty/high-crime neighborhoods throughout the Chicago region. Such programs provide safe places where youth can connect with caring adult tutors, mentors, and career coaches who volunteer to help at-risk youth gain the academic and decision making edge that just might be the difference in a few years, when that child is deciding between a book and a gun. * Sunday, August 29, 2010; PURCHASE TICKETS NOW! 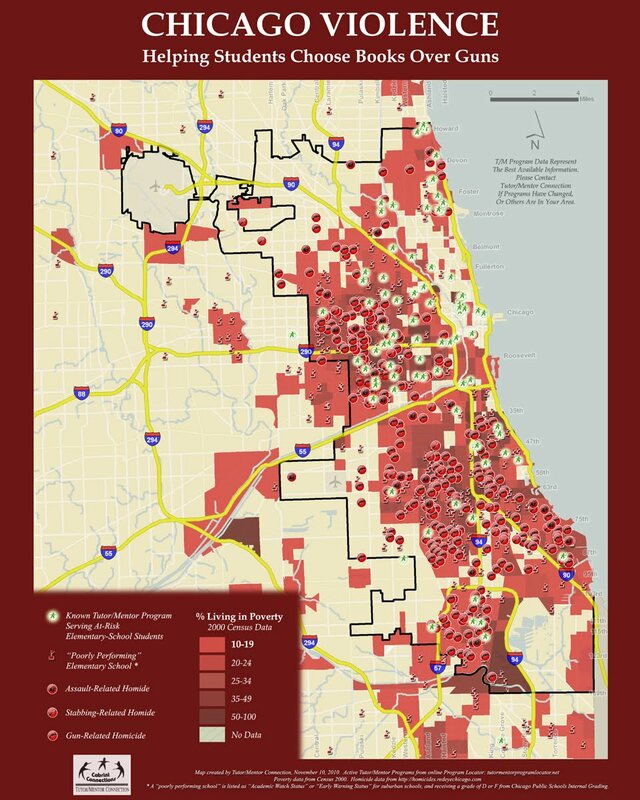 Join the discussion about our maps on Social Edge dot org! How can you take this use of geographic maps -- and tweak it so as to apply it to your own situation, social enterprise or area of passionate concern? 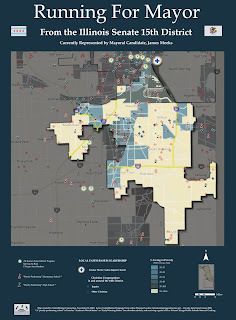 What nearby local services could usefully be mapped alongside yours? What other social concerns (health, education, food, water, online) are relevant in the community you serve? 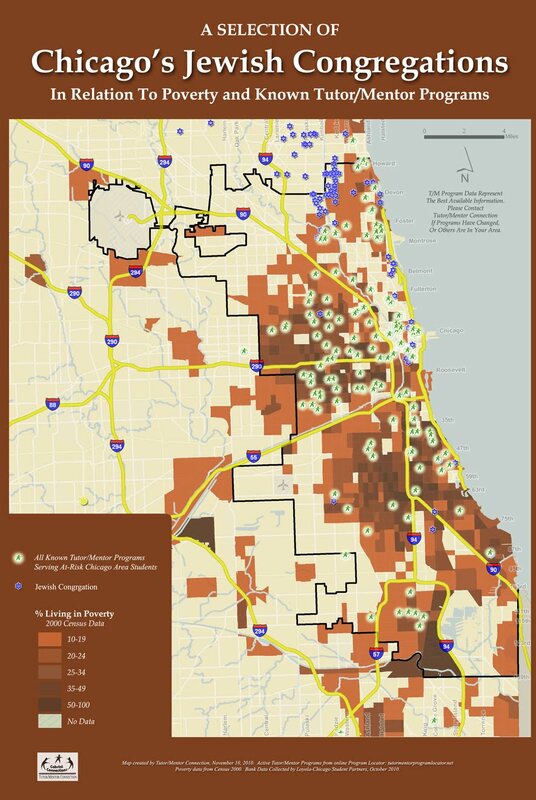 What other factors (poverty, crime, potential funders) could usefully be mapped in your area? 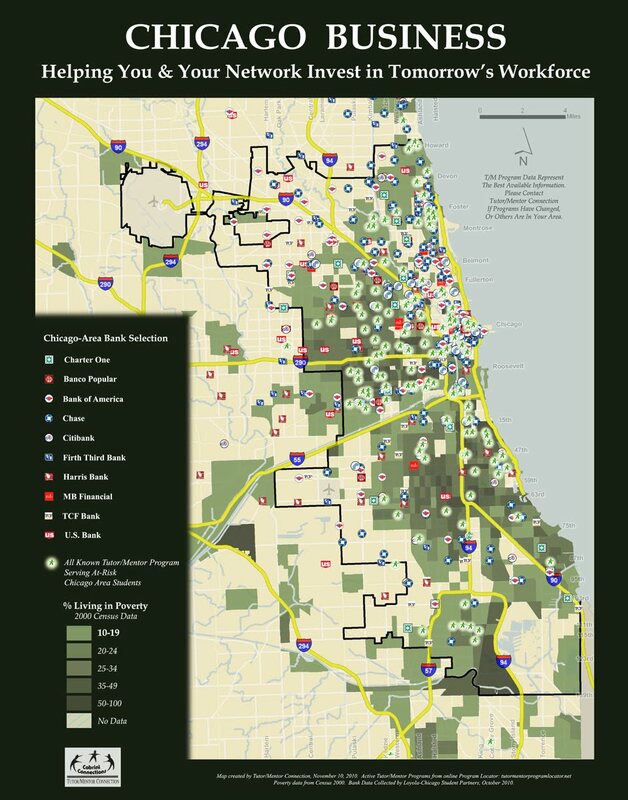 Who do you know (locally, globally) who might benefit from reading about these mapping techniques, applying them in their own situation and/or joining our conversation here? What are you waiting for.... head over there and get in on the discussion!!! Even if you don't head to the Social Edge conversation, these are things we should all be thinking about daily. Please shoot me a email, or start your own discussion right here, if you'd like! 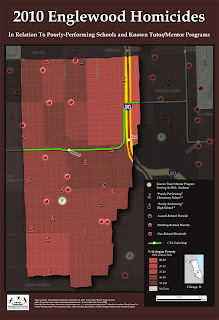 And definitely contact us if you need us to help you create your own maps to answer your questions! Apologies that it's been a couple weeks since I've checked in. So many exciting things happening. I spoke at a national gathering of tutor/mentor thinkers... I continue to produce the 2010 Tutor/Mentor Jam - a music benefit this August at Darkroom (details coming very soon)... 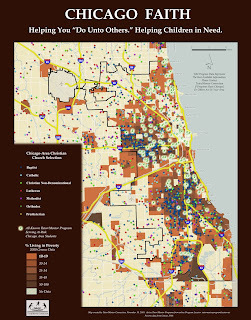 I demoed the video game kids made with me at Cabrini Connections Tech Club, where I volunteer each week... and I'm pumping out maps as fast as I can, to help our local leaders and thinkers visualize the data they need to continue building support for our students... all with a backdrop of escalating crime and a suffering economy. Click on the map below to see for yourself. As the school year ends, I bask in the good vibes received at the Tutor/Mentor Conference from all the people there who told me they use my maps to help their programs fight crime, workforce woes, underprepared students, and other social side-effects of poverty... each of which eventually trickle into tax-payers' laps. The celebration ends there. 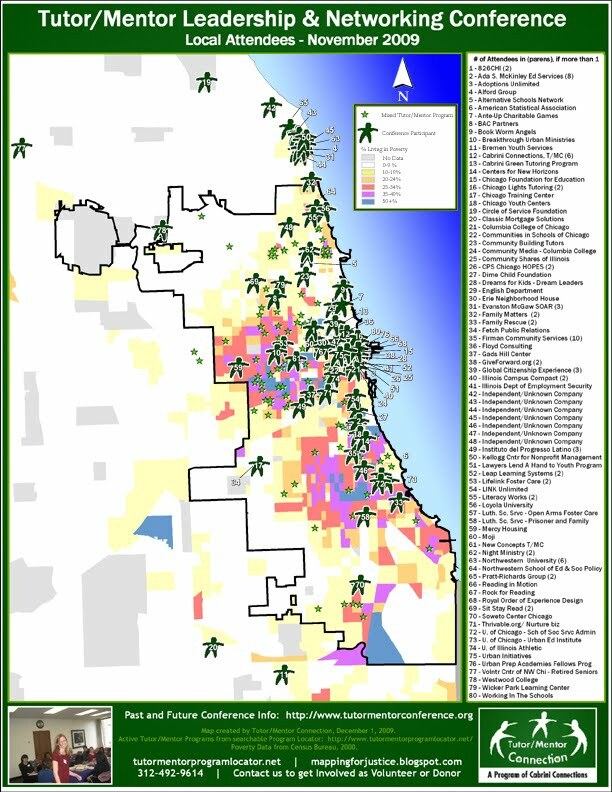 As the blue map above shows, there simply are not enough programs in Chicagoland to help prepare the thousands of at-risk soon-to-be-adults that attend our overwhelmed school system. And while we at Tutor/Mentor Connection struggle to scratch the surface of this problem, it's becoming more and more disheartening that the people I talk to - people who share these concerns and cheer us on, patting us on the back every day... just as quickly disappear back into their daily grind - ending their commitment to this shared cause with a high five, a handshake, and a "good luck!" We need to do this together if we have any chance of success. Each of you who shudder at crime, graduation stats, and our growing taxes... each of you can help fight with us by spending a mere 5 minutes - either to cut a tax-deductible check yourself, or to shoot a quick email to those in your networks with the ability to put us in the ear of someone who can cut that check. You only have to look backward through this Mapping For Justice blog, Dan's blog, Nicole, El, and Bradley's blogs to find other case-studies and reports that explain why you and your overworked, overstressed, and overtaxed friends should care about mentoring at-risk youth - and how you can mobilize your network in support of our students and our collective future via tutor/mentor programs. 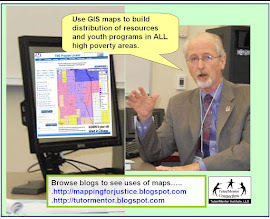 Learn More About My Maps & How They Can Help You! Here's a recent article about why at-risk city youth are your problem whether you live in the city or not. 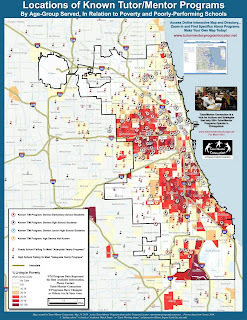 And don't miss Dan Bassill's articles this week about how tutor/mentor programs (or lack of programs) might relate to teen violence and shootings. And another about how YOU can respond and help us work toward stopping the violence. What does all this have to do with the maps I make for Tutor/Mentor Connection? 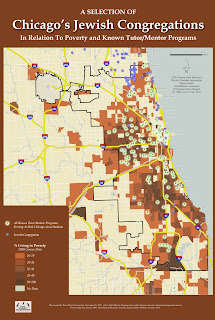 Stop by the May Tutor/Mentor Conference next Thursday afternoon, May 27th, 2010 at Loyola University to attend my workshop and learn more about our mapping technologies... technologies and data available to anyone who wants to help draw attention and resources to tutor/mentor programs in neighborhoods where students need a little more help to prepare for fruitful careers, versus the streets. 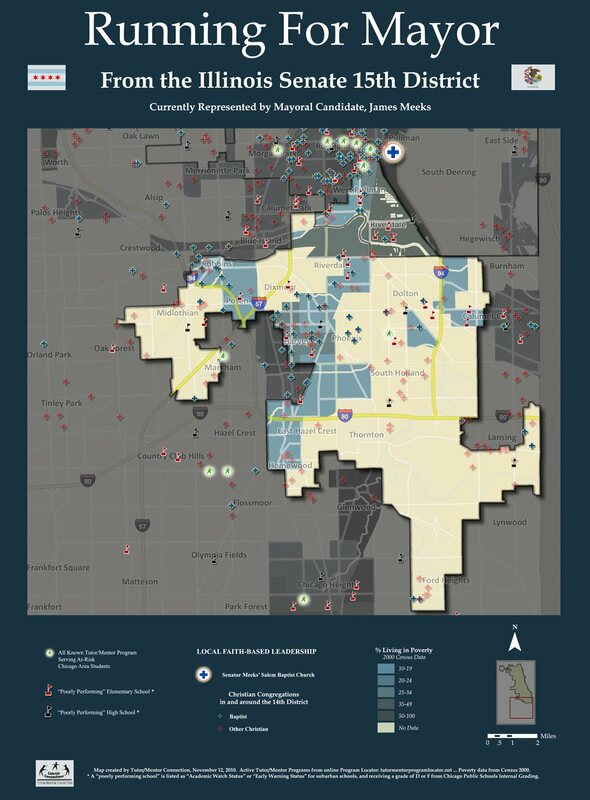 I will also show how local programs, youth groups, students in service-learning classes, journalists with local media, and YOU can create your own maps using our free online program locator. 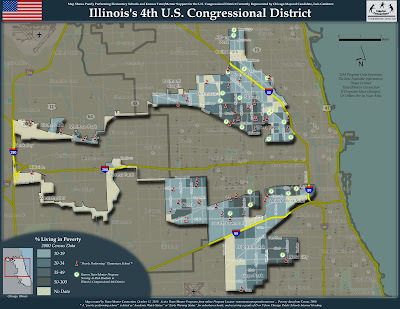 Come with one or two addresses that you would like to map, and you'll leave knowing how anyone can create a blog article and map for justice. Sign up today. Request a scholarship if you need financial assistance. If you can't make it, but money is not the issue, please consider a donation to help maintain this biannual forum and gathering of business, government, media, and community leaders... Help us continue to develop new strategies and technologies, in the name of long-term solutions to our shared social, economic, and workforce ills. 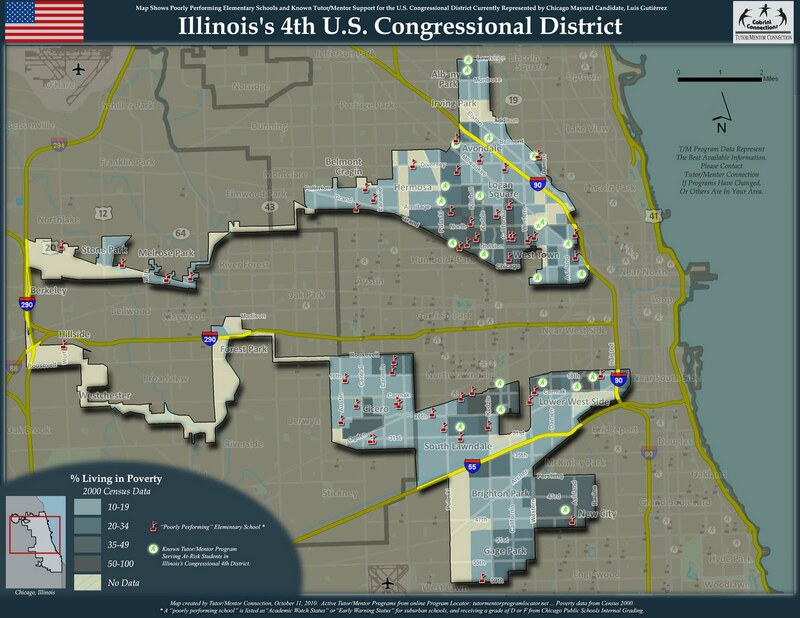 Our Maps Make The World A Better Place - Get Involved! "a great interactive website...geospatial technologies are being used to make the world a better place and encourages people to make their own impact on society." I smell a press kit coming! 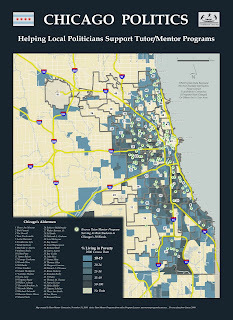 We need more press, more buzz, and more investment... to continue providing innovative tools to those who are building mentoring capacity in areas where our maps indicate there are probably a lot of young, impressionable, at-risk youth. We need to continue providing extra scholastic and decision making skills for kids on the fence in these high-poverty enclaves... kids who have untapped talent and might just choose to side-step the lure of the streets in their teen years, and focus instead on becoming fruitful members of our society and economy... rather than drains on your tax dollars, our economy, and our collective future as Americans. More press. More buzz. More investment. But you don't like crime. 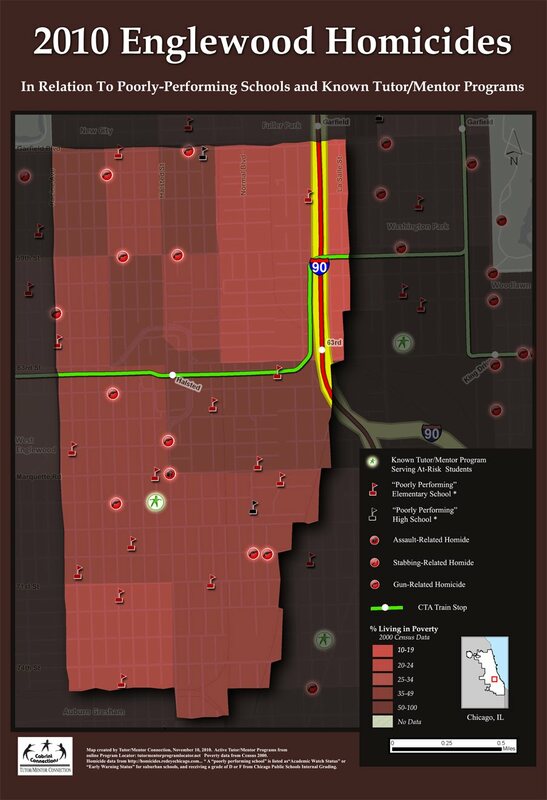 Just click on that map to the left to expand it and see all the crime in Chicago, early this year. The Alliance for Excellent Education estimated that high school dropouts from the Class of 2006-07 will cost the U.S. more than $329 billion in lost wages, taxes and productivity over their lifetimes." “Cost of poverty” reports estimate the costs to the U.S. associated with childhood poverty at $500B per year, or the equivalent of nearly 4 percent of GDP. 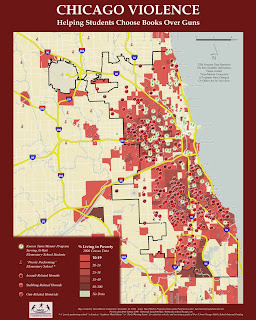 Help us create this buzz and find the investment needed to connect our not-for-profit maps with policy makers who understand that tutoring/mentoring is part of an urgent long-term and comprehensive response to the economic and social burdens we're all facing (versus another high-priced band-aid policy that will have no real long-term effect... like calling in the National Guard, for instance). I won't lie to you. 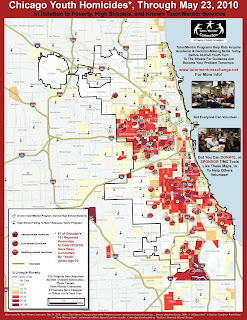 It took a $50,000 donation in 2007 to help us rebuild our map capacity and get to where we are now. That money is gone and we're depending on general donations until we find new sponsors and benefactors to help us get to the next level. 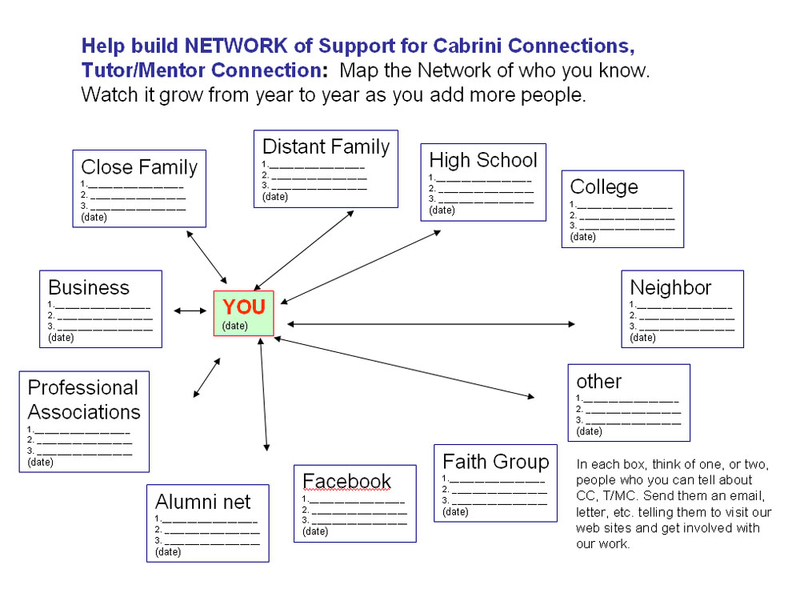 If you have contacts in your network, or a philanthropic budget yourself, you can help us connect our tools to the mainstream today, toward a much brighter tomorrow. 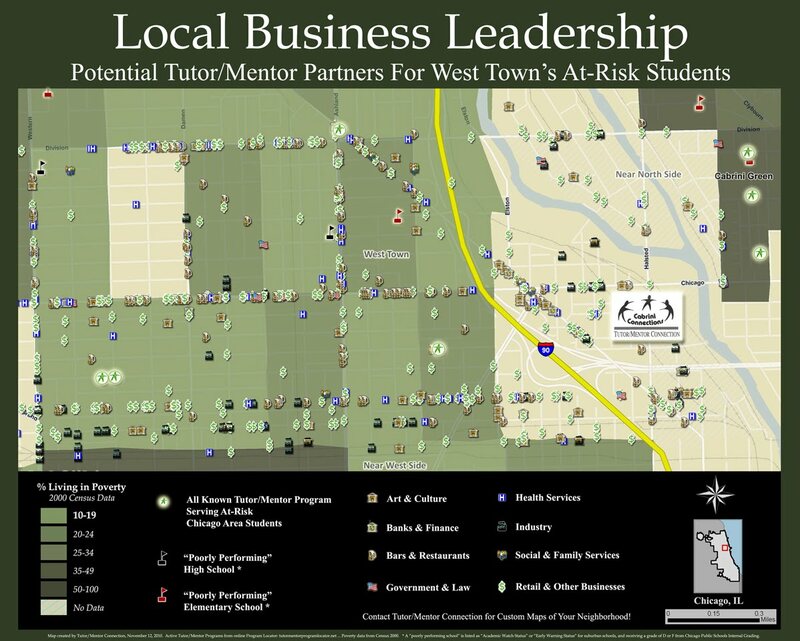 Attend our workshops at the May 27 and 28 Tutor/Mentor Leadership and Networking Conference to meet others who are already invested.